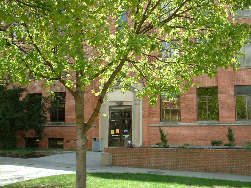 The library was established in 1963 to serve primarily the research and teaching needs of the College of Veterinary Medicine. In 1981 most of the pharmacy collection was transferred from the Owen Science and Engineering Library, and the Pharmacy Departmental Library merged with the existing collection. The "Veterinary Medical/Pharmacy Library" began to serve the needs of not only WSU campus patrons and practicing veterinarians, but also pharmacists and clinical pharmacologists. More than 70 medical journals (as well as liaison and collection development activities for the WWAMI Program and Pre-nursing) were transferred to us from the Owen Science and Engineering Library. To reflect our broader focus, the library was renamed "Health Sciences Library". We serve the needs of WSU faculty, staff, and students requiring information on biomedical topics, as well as practicing veterinarians, pharmacists, physicians, and clinical pharmacologists. To reflect our new focus, the library was renamed "Animal Health Library". We serve the College of Veterinary Medicine, including the Program in Neurosciences and School of Global Animal Health.